What is in your toothpaste? When it comes to taking care of your teeth and gums, perhaps, no one will ever be able to do it without the help of this quintessential oral hygiene product – the toothpaste. Dentists highly recommend that we use it at least twice a day. Once in the morning, and another before bedtime. But do you know what is in Toothpaste that makes this product very important for our teeth? The most important ingredient in toothpaste is fluoride. As a matter of fact, all toothpaste products recommended by the ADA, contains fluoride. Fluoride is used to help fight tooth decay, and it is also used to help strengthen your teeth enamel. But did you know that there are three types of fluoride? Toothpastes can contain Stannous fluoride, Sodium fluoride, or Sodium monofluorophosphate. These types of fluoride are all effective, and they are all capable of protecting your teeth. Some toothpastes also contain other active ingredients which are intended for very specialized reasons. For example, toothpastes that are to be used when your teeth are sensitive to hot or cold food items may contain potassium nitrate to help interact with the nerves within your teeth. This can also seal-off the tiny tubules outside of your teeth in order to reduce sensitivity. 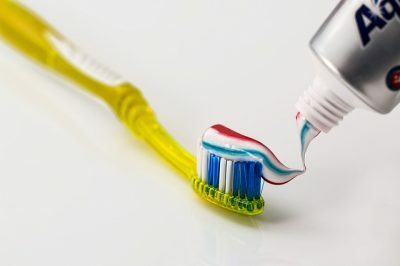 Other toothpastes can also contain ingredients such as pyrophosphates and zinc citrate to help you get rid of tartar, and also help you avoid getting hardened plaque on your teeth. You should take note however, that only a dentist will be able to help you deal with tartar especially when it has hardened. For those who want to avoid early signs of gum disease, you might want to use a toothpaste that contains triclosan and stannous fluoride. These two ingredients can also help you avoid getting bad breath. Most toothpastes that are either in gel or powder form also contain inactive ingredients that are used as polishing or cleaning agents. They are intended to help you get rid of plaque, debris, and surface stains. Some toothpastes will use calcium carbonate, silica, magnesium carbonate, or hydrated aluminum oxides as their inactive ingredients. Some toothpastes which are used for teeth whitening will contain silica abrasives which are very effective against surface stains. Almost all toothpastes contain another inactive ingredient known as a detergent that can help create the foaming action that we get when we use the toothpaste. The detergent is typically in the form of Sodium lauryl sulfate. Your toothpaste can also contain glycerol, propylene glycol, and sorbitol which will help stop the toothpaste from drying. Toothpastes can also contain natural oils or artificial sweeteners to add flavor. The ADA does not recommend toothpastes that contain sugar as it can promote tooth decay. Thickening agents are also used to help keep all the ingredients together. When purchasing toothpastes, always look for the ADA seal of acceptance. When brushing your teeth, use a good toothpaste and brush it on your teeth twice a day for two minutes each time for proper removal of plaque, and for adequate exposure to fluoride.